Developed and produced in Vienna. The case is made of 1mm high-strength steel sheet. Side parts are made of moulded wood with real wood veneer. Those and further component parts are produced in Vienna by specalist companies and assambled by FLKeys. Keys and most mechanical parts of the keyframe are produced in Italy, refined and supplemented in Vienna by FLKeys. To cut it short, we don't just profit from Central Europe's 300 years of piano making tradition. 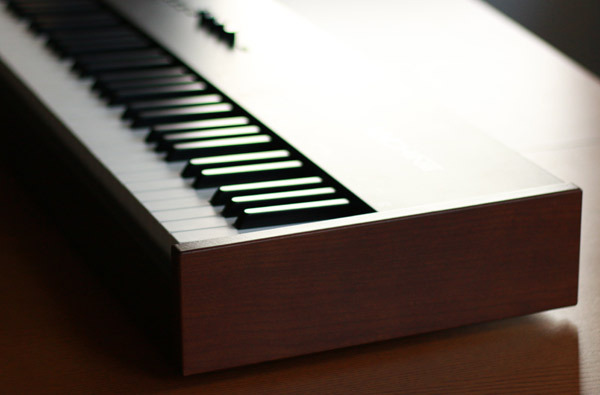 All that makes a unique instrument: the first Vienese keyboard made by FLKeys. As we are very poud of our product, we mark each one with a unique handwritten opus number. We always try to avoid unnecessary garbage. But some carrier and parcel service handle their freight unfortunately rather gruffly. We pack our MK's in a high quality specially made customized cardboard with hand fitted damping parts as an inlay. Also we try to reuse and adapt available packaging material as much as possible. We hope you appreciate our efforts to preserve resources.